Black History Month is celebrated in February. Celebrate with Black History Month worksheets, including coloring pages, word scrambles, missing letters, writing prompts, and more. 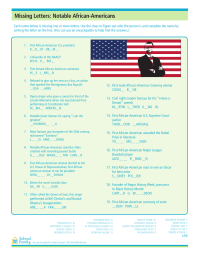 Check your knowledge of notable African Americans with this Black History Month crossowrd Puzzle. African Americans have contributed enormously to American culture and progress. 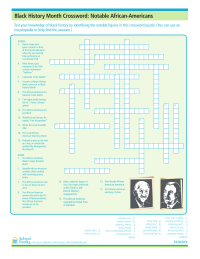 Test your knowledge of notable African Americans with this Black History Month crossword puzzle worksheet. Celebrate Black History Month with this acrostic poem activity. Think of a word or phrase that starts with each letter of the word "heritage." Celebrate Black History Month with this coloring page.